The mythical Miura bull-breed, a veteran of the Sanfermin fiestas (The 54th time that they feature), and always known for their noble behavior, once again featured in this Sunday morning running of the bulls in Iruñea-Pamplona. The course was packed with runners – as is to be expected at a weekend – and it lasted exactly five minutes. There were five runners gored and another six runners were also taken off to hospital suffering from injuries. Data from the software program, Bullrunning Analytics, make this Sunday morning the one with the most gorings ever in recent times. Once again, a loose bull has been the fatal protagonist in this morning's running of the bulls. A violet-colored bull by the name of "Ermitaño" got separated from the rest of the pack after crashing violently into the fencing at the Mercaderes bend. It charged and gored several runners along the length of the course. The worst moments of great anguish occurred at the entrance leading into the bullring, where the bull tossed and played with a runner as if he were a rag doll and gored its victim at least twice. The pack charged out of the pen at Santo Domingo at a fast pace and the bulls stayed close to the bell-oxen all the way to Mercaderes without paying much attention to the many runners who filled the length of the course this morning. At the Mercaderes bend a runner who was on the left side of the stretch, surrounded by bulls, was gored in the neck. 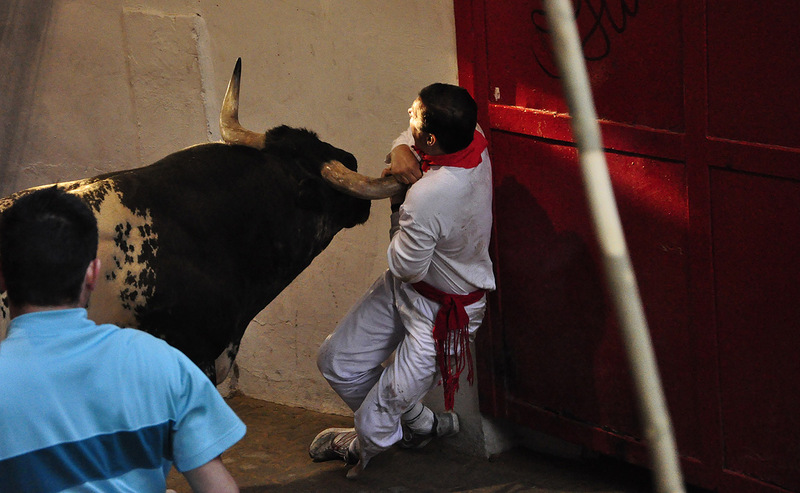 Immediately afterwards three of the bulls crashed violently against the fencing on the Mercaderes – Estafeta bend. Here the pack now broke up and the violet-colored bull, "Ermitaño" got separated from the rest of the bulls. The bulls ran ahead in a looser formation up the stretch of Estafeta street. The leading bulls ran closely together with the bull-oxen over the whole stretch. The danger was the final bull, "Ermitaño" who was alone and disorientated, and this animal charged several times against runners along the length of the course. The first five bulls were now running in two groups of three and two at a fast pace. The rear bull stopped and turned several times, particularly at Telefónica and at the final stretch leading into the bull ring. Here at the entrance to the bullring, "Ermitaño" created moments of great danger and anguish and he tossed and turned a runner over several times, giving him two serious gorings. In spite of the fact that the runners and the bull-minders were anxiously trying to distract the bull from its victim, the bull continued to toss its victim against the fencing and against the ground with great violence. Finally, with the help of the runners and bull-minders, the ominous protagonist of today's running was eventually lead into the bullring and towards the safety of the pens after a running which lasted five minutes.